Through the use of conventional print technologies, the ability to apply varying types of covert security features has been available for quite some time. One of these covert features includes adding invisible elements to packaging for anti-counterfeit and brand protection purposes. Nosco has crossed over into a new and exciting time where the digital print revolution can bring about new methods of brand protection and anti-counterfeiting solutions using invisible ink technologies. Implementing these technologies via the digital platform offers Nosco customers a new, more robust level of brand protection and authentication than ever before. 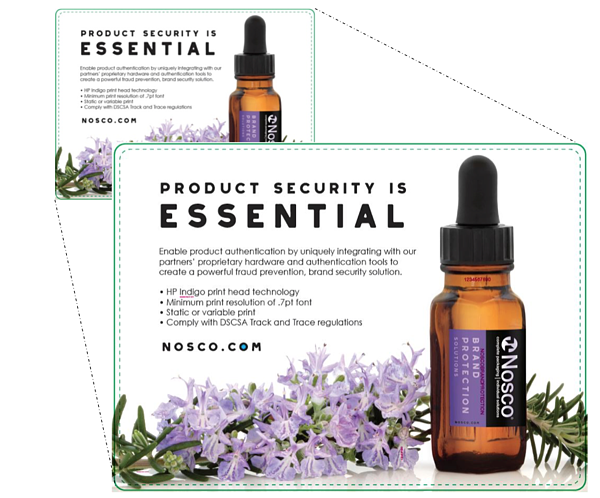 As a secured product, Nosco is able to supply clients with an entire supply chain credential, further protecting their brands and making it more difficult to emulate or reproduce items. Invisible ink technologies are currently available on digital labels, with a target to launch on digital cartons in mid-2018. With these new features, Nosco will be there to help protect your brand.